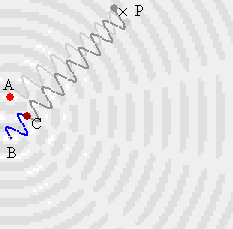 Click a point on the pattern, the two waves emanating from the two sources and superposing at that point will be shown. 1. What are constructive and destructive interferences ? Constructive interference occurs at a point when the two waves arriving there are vibrating in the same direction (in phase). Hence, the two waves are added together to form a bigger one (e.g. crest + crest = big crest; trough + trough = big trough). Destructive interference occurs at a point when the two waves arriving there are vibrating in the opposite directions (anti-phase). Hence, the two waves cancel one another out (e.g. crest + trough = zero). With reference to the above diagram, AP is generally not equal to BP. The part shown in blue (BC) is the difference between them. After cutting BC, the two remaining paths (shown in gray) are equal in length. Any waveforms arriving the two red dots will later arrive P simualtaneously (same length, same speed), hence the relationship between the vibrations (in phase, antiphase or others) of the two red dots will be exactly the same as that of the two waves superposing at P . In other words, the phase relationship between A and C predetermines the kind of interference at P.
Two points separated by intergal multiples of wavelength along a sinusoidal wave train are always vibrating in the same direction (in phase). Hence, B and C are in phase. A and B are in phase, B and C are in phase. So A and C are in phase, the interference occurring at P is constructive. Two points separated by such distances along a sinusoidal wave train are always vibrating in opposite directions (antiphase).Hence, B and C are in antiphase. A and B are in phase, B and C are in antiphase. So A and C are in antiphase, the interference occurring at P is destructive. Such path differences guarantee B and C are in phase. But A and B are in antiphase, so A and C are in antiphase. P has a destrucive interference. B and C are in antiphase. A and B are also in antiphase, so A and C become in phase. P has a constructive constructive.